Last weekend, Bournemouth played host to the cream of the UK trickline community as slackers assembled to do battle at the Portlebay Popcorn UK Slackline open 2013. 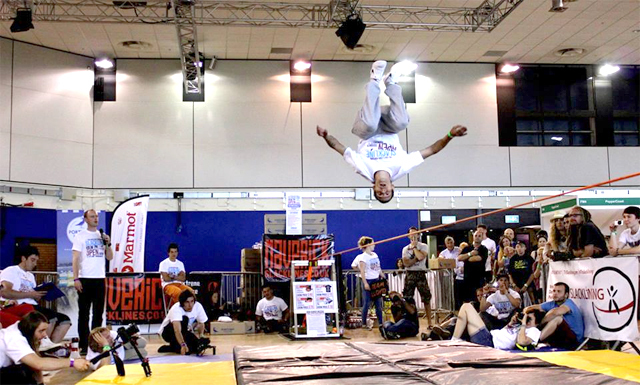 As one of the main attractions at the Family Adventure Fun Festival in the Bournemouth International Centre, Maverick Slacklines proudly hosted the UK’s first officially licensed WSFed Slackline Open, meaning that the top 16 successful competitors would receive ‘points’ that see them placed on the international world ranking list! Thanks to our sponsors – Portlebay Popcorn, Aquajuice and MADD there was also an incredible £1000 cash prize purse up for grabs! Following on from a well oiled and efficient set-up day on Thursday, including moving 6 tons of ballast by hand to create the anchors for the competition line, Friday was a fairly relaxed affair with competitors arriving from all across the country and warming up for the competition, spectators trying slacklining for the first time with the help of Tri-slacklining’s experienced coaches, and everyone hanging out enjoying the atmosphere, the glorious weather, and a seemingly endless supply of tasty snacks and refreshing drinks kindly supplied by Portlebay Popcorn and Aquajuice! In the evening we all moved to the beach to relax before the big day, enjoying barbeques at the slackline park and putting on a show for the sun-worshippers on an impromptu 80M+ longline. Saturday was competition day and it was a great turn out of both familiar faces and new ones. Over 30 people registered to compete ranging in age from just 9 to 50! It was great to meet the next generation and really inspiring to see very young slackliners not only competing but confidently mixing it up in a session with the bigger guys on the competition line, which in some cases was as tall as them! HUGE props to future stars Jayden and Alex for getting involved. The qualification process involved whittling the field down to the 16 who would go head-to-head in the knock-out stage of the competition. There were 4 seeded competitors leaving just 12 places up for grabs, which were decided by a 60 second solo-performance giving competitors a chance to show the judges what they could bring to the final rounds. Many of the battles were very close, testing the judges and reflecting the advancement and growth of the community over the last year. 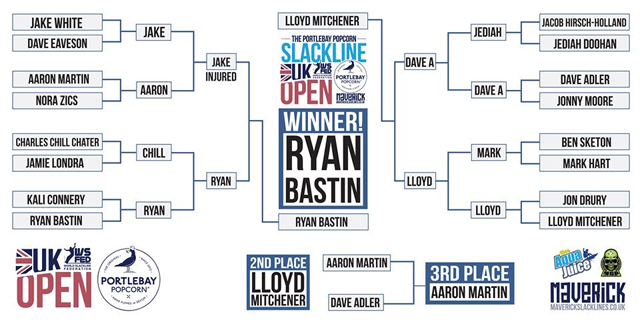 After 2 rounds of competition the field had been cut down to the final 4 and the semi finals were old foes from the South – Ryan Bastin Vs. Jake White , and the exciting pairing of hometown-hero Lloyd Mitchener Vs. Dave Adler, representing the North. Again, the battles were incredibly close-fought. Lloyd gave a fantastic high-energy performance to secure his place in the final. Jake, giving it all he had in an epic battle to deny favourite Ryan access to the final round, unfortunately picked up an injury and after only narrowly losing to Ryan was unable to compete for 3rd place. This gave quarter-finalist Aaron Martin a second chance and the opportunity to compete against Dave for 3rd. Aaron valiantly stepped up to the plate, taking the £100 prize for 3rd place. The Final round was a hard fought war between the raw power of Ryan and his big tricks and the effortless style and consistency of Lloyd and his raucous entourage of adoring fans! 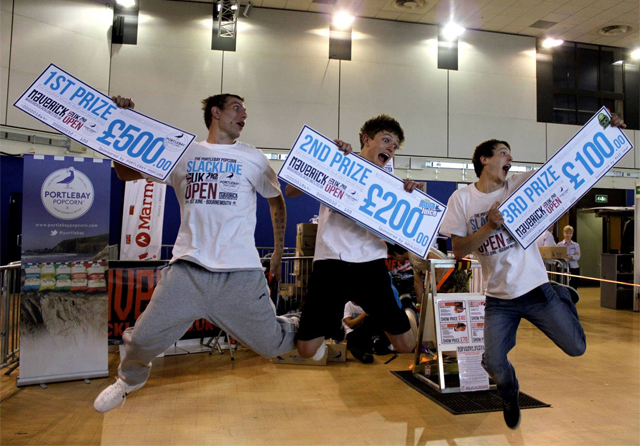 Despite the overwhelming support of ‘TEAM LLOYD’ and a stylish performance, he just didn’t quite have the difficulty of tricks to match the world-class display of flips and spins from Ryan, who took the win and the £500 1st prize with Lloyd taking £200 for second. After a long day of competition, the slackline community once again descended onto Bournemouth beach, wowing half-term holiday-makers with their skills in a relaxed session with tricklines, rodeo lines and a longline, fuelled well into the night by barbeque and drinks. The Poole/Bournemouth area is leading the way with installing slackline parks and the scene down here is thriving, combine this with the great weather and miles of sandy beaches and the great atmosphere on Saturday evening lead to the coining of the term ‘Brazilmouth’ in homage to the booming Brazillian beach slackline scene and the almost tropical feel of the south-coast beach-resort in holiday season. The more experienced team South comprehensively took the win with a combination of some technical dynamic tricks and some old-school static moves, testing the Northerners to the limit. Rather than going home with their tail between their legs, Team North have vowed to train twice as hard and come back next year to teach us a lesson! I’m looking forward to it!!! It’s always special when the slackline community comes together, it’s such an eclectic mix of interesting and talented characters, and this was no exception! It was an absolutely incredible weekend. 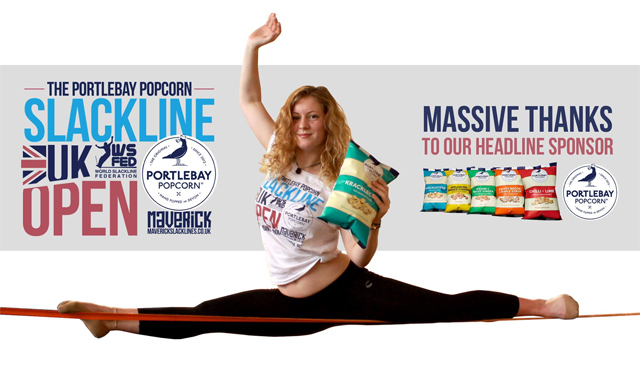 We’d like to extend a HUGE thankyou to everyone who made the effort to come and support the event, especially the competitors, to our main sponsors Portlebay Popcorn for making it possible and for all the tasty popcornn, Aquajuice for keeping thirst at bay with your refreshing drinks and MADD, and to our fantastic crew from Maverick Slacklines and Tri-Slacklining for pulling it all together so smoothly… You’re the best!!! Time to start planning the next one!